Spectra: Low-resolution spectroscopy indicating that PNV J16484962-4457032 is a Fe II type nova in the stages was obtained by S. C. Williams et al. 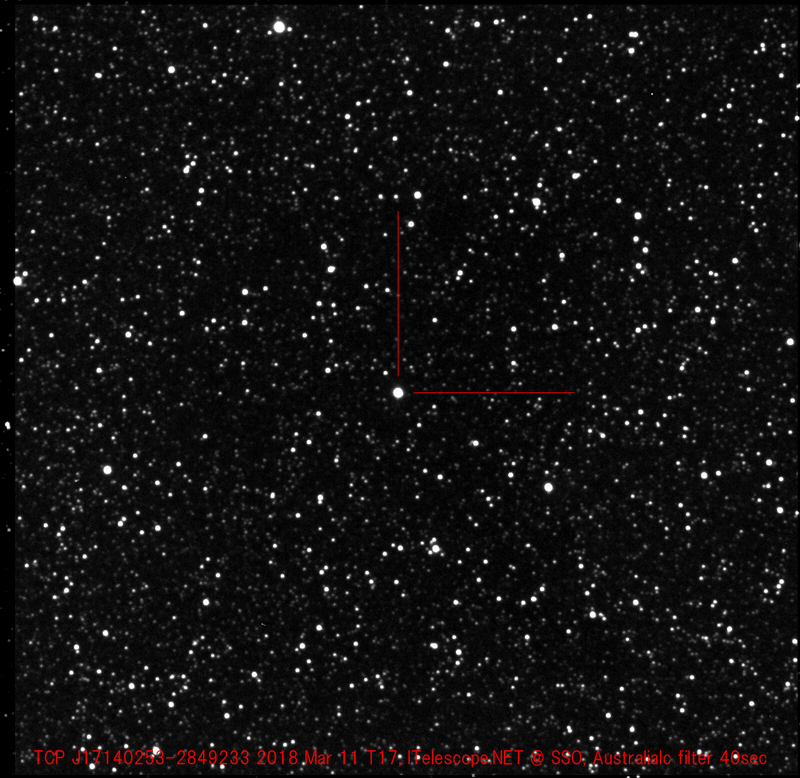 (ATel #11398) using the FRODOSpec spectrograph on the 2-m Liverpool Telescope. Charts: Charts with a comparison star sequence for N Oph 2018 No. 2 may be created using the AAVSO Variable Star Plotter (VSP). Submit observations: Please submit observations to the AAVSO International Database using the name N OPH 2018 NO. 2. Once a GCVS name is announced in an IAU Circular or CBET, please use that name. a. Designated PNV J17140261-2849237 and TCP J17140253-2849233 when posted independently by Nishimura and by Kojima, and by Nishiyama and Kabashima, respectively, to the IAU Central Bureau for Astronomical Telegrams Transient Object Confirmation Page (TOCP). 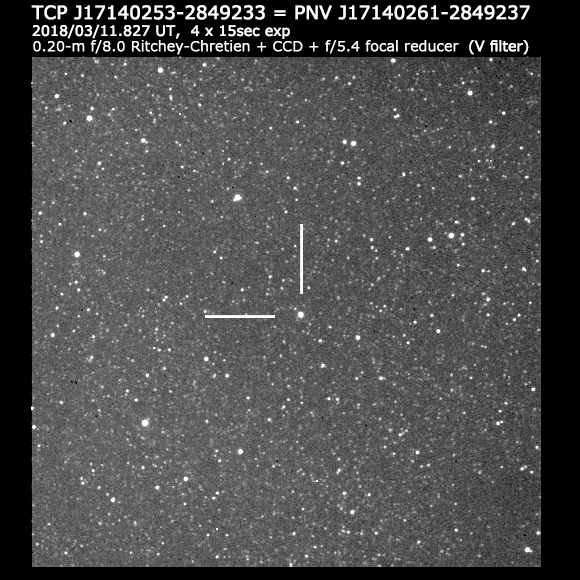 Unless otherwise noted and except for observations reported to the AAVSO, the information in this Alert Notice is taken from IAU CBET 4492.
b. Nishiyama and Kabashima confirmed their discovery immediately on unfiltered CCD frames taken around 2018 Mar 10.830 UT. c. Nishiyama and Kabashima report nothing was seen on DSS or USNO-B1.0 images. d. Nishiyama and Kabashima report the nearest star in USNO B1.0 has position end figures 02s787, 26"76, distance 4"8, magnitudes B2=17.35, R2=17.17, I=14.90. 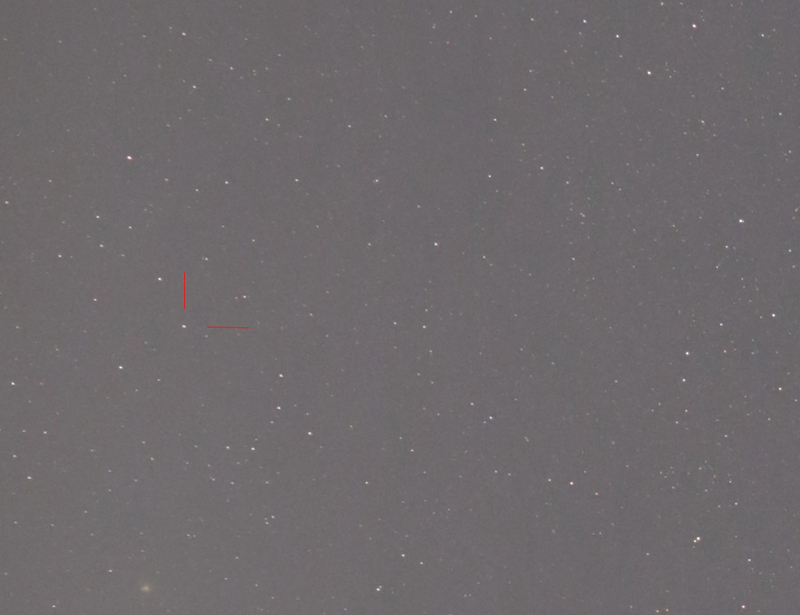 - Nishimura (2018 March 10.805 UT, discovery): 02.61s, 23.7"
- Nishiyama and Kabashima (2018 March 10.830 UT): 02.53s, 23.3"
- T. Kojima (2018 Mar. 10.807 UT, discovery): 02.50s, 23.5"
- K. Yoshimoto (2018 Mar.11.827): 02.55s, 23.7"
Congratulations to Hideo Nishimura, to Tadashi Kojima, and to Koichi Nishiyama and Fujio Kabashima on their latest discoveries!